※ RC-100A is not produced currently; it is not sold any longer. 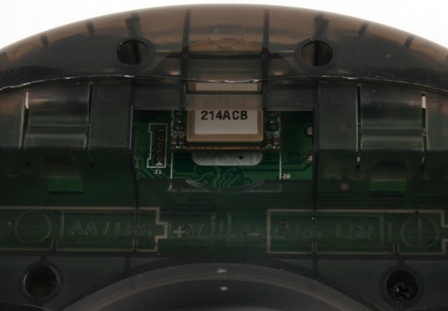 This is a devices to communicate with the robot via IR, ZIGbee, or Bluetooth. If nothing is mounted the default communications is via IR. 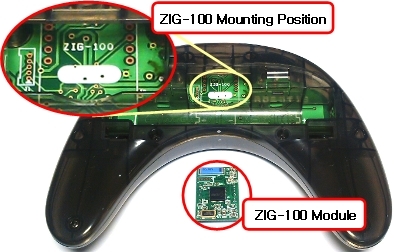 Mount the ZIG-100 to communicate via ZIGbee. 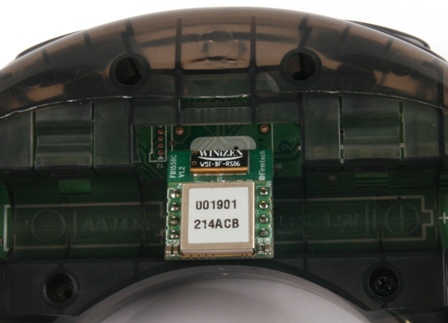 The RC-100 lights green and RC-100A lights blue when mounted with a ZIGbee or Bluetooth module. POWER/MODE in the middle is the power button. Red LED flickers 2 times if the button is pressed. Pressing POWER/MODE button for more than 1 sec, red LED filckers 3 times (4 times when ZIG-100 is plugged), and then it is turned off. 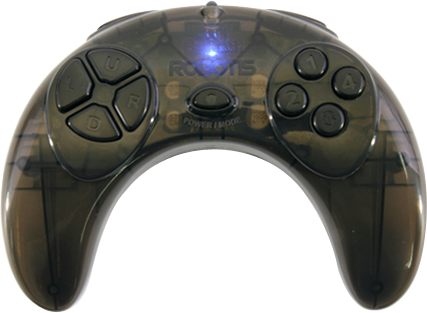 If RC-100 is not used for more than 2 minutes, (if no buttons are pressed) the power is automatically turned off. 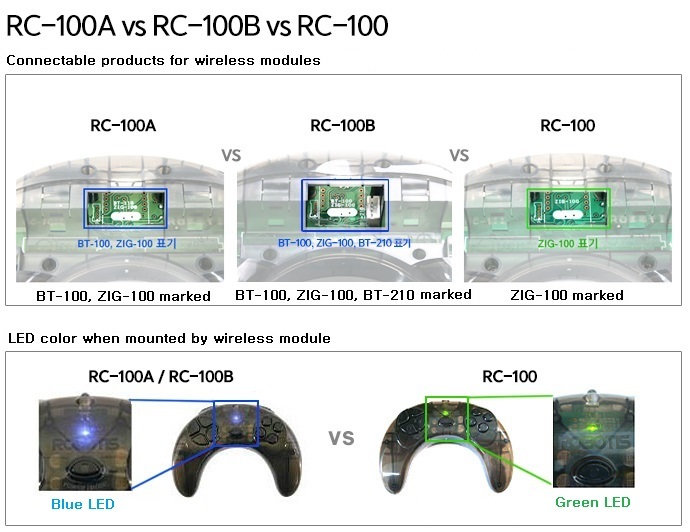 If the button of RC-100B is pressed, the packet related to the pressed button is transmitted to the receiving module which is synchronized by the connected transmitting module. Even at the moment of releasing all buttons, the packet which shows the buttons are not pressed is transmitted. Please refer to Remote Control Code Map on the packet. Wireless communication packet can be transmitted using IR-Receiver-installed CM-100A, CM-510 and CM-530. 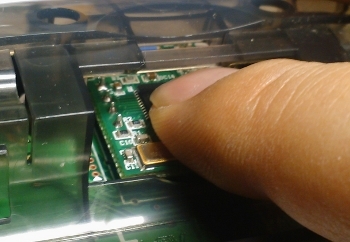 Wireless communication packet can be transmitted using ZIG-100 module-installed CM-5, CM2+. 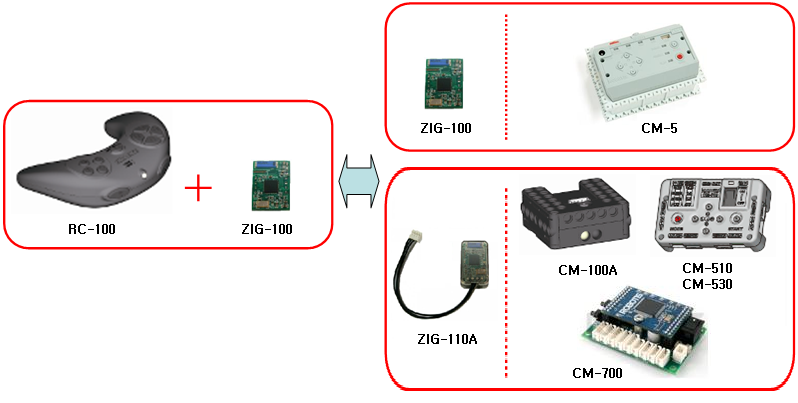 Wireless communication packet can be transmitted using ZIG-110 module-installed CM-100A, CM-510, CM-530 and CM-700. The BT-100A can be mounted onto CM-100A, CM-510, CM-530, and CM-700, and transmit data wirelessly. Open the cover of the rc-100 and insert the zig-100 module properly. 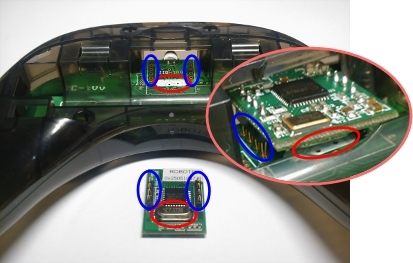 Insert the module as below so that the red-circled parts can contact each other. 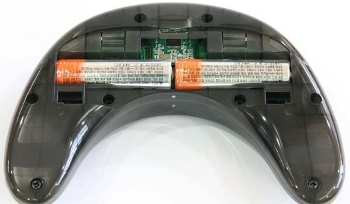 Press firmly to insert ZIG-100/BT-100 module using fingers or long stick etc. 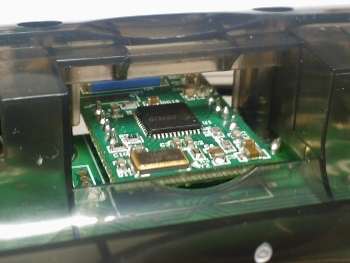 The following picture shows ZIG-100/BT-100 module is installed completely in RC-100A. During an impact the zig-100/bt-100 may be dismounted from the rc-100. In this case rc-100 defaults to IR communications. It is possible to set 4 channels with buttons, if the ZIG-100 on RC-100Z was set at Broadcasting Mode (Multi: Multi communication mode). 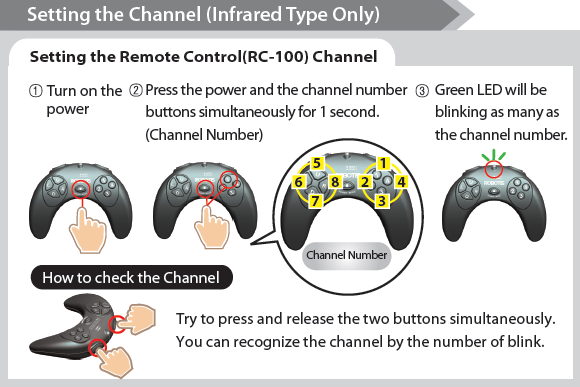 Channels can be changed if you press the number buttons (1~4) together while MODE buttons are being pressed. 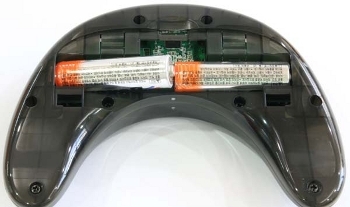 The red LED will blink as many as the channel no. , when the channel is changed. Caution 2 : The ZIG-100 communication can be discontinued for seconds when changing the channels. 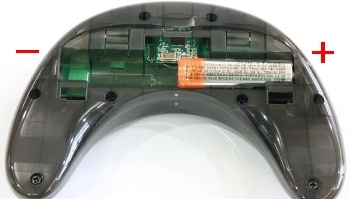 Caution 3 : When you take away batteries, the channel will be reset at initial status automatically and you need to reset it. 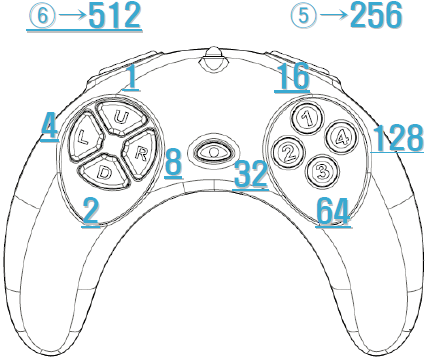 Button 5 and 6 are not available under IR control mode. When you press the buttons on RC-100, corresponding code value of each button will be sent out. When more than 2 buttons are pressed, the sum of pressed code values will be sent. ※ There are 128 combination keys usable in IR Mode. ※ There are 512 combinations keys usable in Zigbee Mode. Open the lid on the backside. 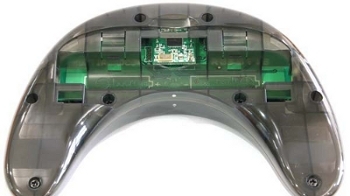 Press firmly to insert the batteries. If there are problems with the RC-100A’s Bluetooth or ZigBee and LED flashes try replacing the batteries with new ones.